Maldives Meteorological Service (MET) on Tuesday forecast scattered rain, occasional heavy showers and thunderstorms in Central and Southern Atolls, and thundershowers in Northern Atolls from April 16 - 17. Capital Male' also experienced thunderstorms and heavy rainfall on late Monday. Local media Mihaaru reported that, according to a MET official, Central and Northern Atolls would experience heavy rainfall on April 16, whereas Southern Atolls would face drizzling rain. The official forecast rainfall all across the nation, and described the precipitation as the transition between the two monsoons of Maldives. Currently, Maldives is experiencing 'Assidha', the first interval of Hulhangu (South-West) monsoon season as notated by the indigenous Maldivian calendar. “This is not, as of yet, Hulhangu monsoon rain. The Hulhangu monsoon will begin in mid-May. 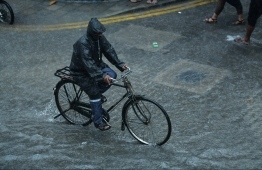 This is the interim rain between the two monsoons”, said the official. MET revealed that despite rainfall across the nation, the seas are expected to be slight to moderate during the showers, thereby not impeding sea travel. It further forecast that surface winds will be from 05 – 15 miles per hour. On April 15, the Salatul-Istisqa (Islamic prayer for rain) was held in all islands due to the long-term drought faced in Maldives.